Prop Store – An incredibly rare Imperial TIE fighter pilot helmet from Star Wars: A New Hope, and subsequently used in the hit sequel Star Wars: Return of the Jedi, is to be made available at public auction in the United Kingdom. Based on concept designs by costume designer John Mollo,the helmet combined components from the iconic Imperial Stormtroopers and heroic X-Wing pilot helmets to create a truly unique design that has gone down as one of the most popular in the history of the famed franchise. The helmet is one of over 100 pieces used in the production of the Star Wars films that will be hotly contested in Prop Store’s 27 September Entertainment Memorabilia Live Auction, held at London’s BFI IMAX proudly presented by ODEON. While there are numerous known examples of the Imperial Stormtrooper helmets from the original series, only a handful of TIE fighter pilot helmets a known to remain in existence today, with even fewer in private hands outside of the Lucasfilm archives in Nicasio, California’s Skywalker Ranch. Compared to the Stormtrooper helmets, only a small number of TIE fighter pilot helmets were made, making them incredibly rare and of great interest to collectors and fans alike. Made for Star Wars: A New Hope, two of the helmets were repurposed for use by AT-AT pilots in The Empire Strikes Back, leaving the remaining helmets to be used by fleeing Imperial pilots in Return of the Jedi. 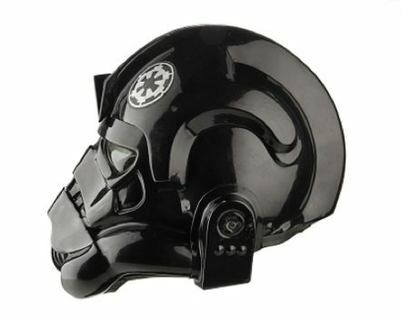 The Prop Store is proud to offer one of the rarest helmets from the Star Wars franchise, a piece perfect for any die-hard Star Wars fan’s collection. The helmet is estimated to sell for between £50k and £70k. Additional pieces from the Star Wars franchise, including Rebel vests from Star Wars: A New Hope (£4k-6k), a model miniature X-Wing from Star Wars: The Empire Strikes Back (£60k-80k estimate) and an original ILM motion control camera used in the production of the entire original trilogy (£30k-50k estimate) make up over 500 lots from the world of film and television, all going under the hammer on 27 September 2016 from 12PM. The auction will be live-streamed online for fans to track the bidding on auction day. A free preview exhibition will be open to the public in the run up to the auction, open from Wednesday 14 September at the BFI IMAX and showcasing over 300 lots from the upcoming auction. Star Wars fans will have an opportunity to see the iconic helmet and many other treasures in the exhibition. Registration and bidding is now open. Bids can be placed online at www.propstore.com/liveauction over the phone or in person. The free exhibition open to the public at the BFI IMAX, Waterloo, London, England SE1 8XR from 10:00am to 9:30pm, 14 - 27September 2016. Prop Store’s Entertainment Memorabilia Live Auction, in partnership with the BFI IMAX proudly presented by ODEON, will take place at the BFI IMAX Waterloo (1 Charlie Chaplin Walk, London SE1 8XR) on Tuesday 27 September from 12:00pm.